Whether for a business trip, for leisure or for a romantic weekend, the Hotel Renaissance provides you with a unique setting for a stay full of charm in the heart of the town of Castres: at your disposal are some twenty themed rooms and suites, spacious, with unique character, each one different, and each equipped with all modern comforts. The Hotel Renaissance is housed in a beautiful half-timbered and red-brick residence, dating from the seventeenth century, which has preserved the spirit of a former mansion of the old town. Having been the setting for lively encounters since the Belle Epoque period - all the charm of which it retains today - the hotel invites you to discover its unusual décor, its generous spaces and its contemporary furnishings. The hotel Renaissance offers themed rooms and suites, spacious, with unique character and equipped with all modern comforts: private bathroom with bathtub or shower, WC, hairdryer, complimentary toiletries, reversible air-conditioning, heating, TV, free WiFi Internet access, minibar, desk, telephone with direct line and double-glazed windows. - 2 Senior Suites & 3 Junior Suites: These are of very generous proportions (between 36 and 40 m²) and are named after historical periods : The Rococo, The Napoléon III, The Renaissance, The Bohème and the Imperial Asia. On your arrival in your Junior Suite, in addition to the hotel services (wake-up call, meal-tray / breakfast service in the bedrooms, laundry / drycleaning, receipt of faxes, access to the Internet, etc.) the Hotel Renaissance will provide : A courtesy tray with kettle, instant coffee and choice of tea; a warm dressing-gown in winter, or lightweight kimono in summer; slippers; branded welcome toiletries. - 5 Superior rooms: Also generous in dimensions (between 26.53 m² and 31 m²), with décor and furnishings created around themes as their names suggest: New York, Rétro, Medieval, Aristocrat et Exotic. - 10 Classic rooms: Although the size may be more modest (from 14.50 m² to 21 m²), each of these also have a personalised touch, whether contemporary, art déco, animalist, or (Parisian, New Delhi, Spring, Japanese, Maryline, Unicorn, Polar, Marrakchi, Princess or Estival). Beautifully decorated, a special attention has been paid to the creation of different ambiences which contribute fully to the charm of the place. An establishment patronised by numerous political figures, artists and media personalities, the Hotel Renaissance does everything to ensure you an enjoyable stay. - Tearoom: During the daytime and summer evenings, the hotel’s little courtyard is an ideal place to take some refreshment. In winter, the" salon de thé" – next to the lounge fire - provides you with several varieties of tea or other hot drinks, as well as pastries. - Bar: When evening comes, our intimate bar will allow you to relax. It’s a place to meet, a convivial place where the soft music lends itself to moments of relaxation and to conversation with friends. - Loan of Laptop: You have forgotten your PC and you need to consult your e-mails... We will put at your disposal a mini-computer, and a printer if necessary. - Washing and ironing service: your clothes will be washed and ironed within 2 hours. The hotel can also make available an ironing-board and iron. The hotel Residence is ideally located in a quiet street in the historic heart of the town, a few steps from the Place Jean-Jaurès where colourful, bustling markets are held, close to the main institutions, shops, restaurants, the theatre, museums, the famous tanners’ houses on the banks of the Agout river, the pedestrian streets and other places of interest. Business travelers will easily reach - through the pedestrian streets - the many institutions, administrations and shops of the town. 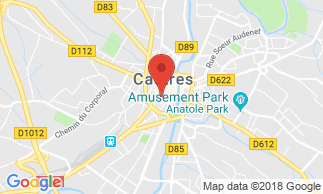 Tourists wishing to visit the historical heritage of Castres will discover in the historic centre, where the hotel is located, the Goya and Jean Jaurès Museums, old mansions, churches, the cathedral, the pedestrian streets, the bishop's Palace built by Mansart and its gardens designed by Le Nôtre. Breakfast is not included in the room rate: 12 EUR per person. Start the day with a generous buffet breakfast served in our cosy dining-room, from 7 am to 10 am. * For those who prefer a light breakfast, with just a hot drink and a pastry, you can enjoy just that, served in the hotel bar. * For those who like to get up a little later, you can request your own personalised breakfast which can be served on a tray in your room at any time. (Extra charge: 3 EUR per person). Thank you to inform the hotel in advance in case of arrival outside these opening hours.